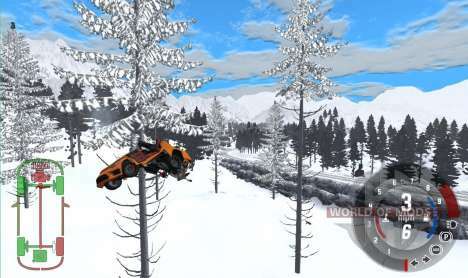 BeamNG.drive is a game in the genre of simulation of collisions, which gives almost limitless possibilities for the creative player. Meet another selection of interesting GIF from the gaming community BeamNG.drive. There will be many interesting. [+] Did you forget something? [-] Did you forget something? High speed and long jump. That's what made this GIF. The white car after landing continued as if nothing had happened. After then the car lost its spoiler. Apparently he was no longer needed. Unfortunately, is unknown why the car was crumpled. But this is not the only thing that was waiting for her. Probably the truck driver was not a good day. I imagine this moment, like in the movies: the driver slowly turns his head to the side and saw that move on it. Free Hugs? Hit the bull's eye. More accurately in the truck. Perfect landing. Only one question: how many attempts did he make? A compilation accidents in BeamNG. I think that no one would like be a participant or witness of this. So here is a compilation of moments in BeamNG.drive. Hope you liked it. Stay tuned, download cars for BeamNG from our website and create your own funny moments. Leave them in the comments and the best ones we will publish in the next episode.